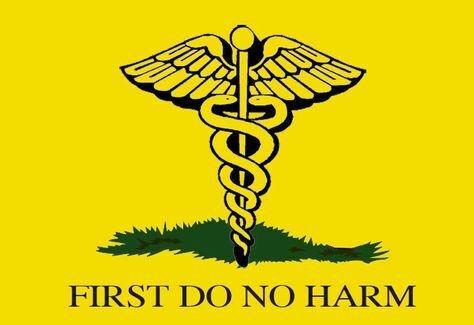 I was brought up by my surgical mentors to be guided by the saying “First, do no harm”. More recently I am inclined to think that this rule may actually cause harm. Let me tell you about Mary (name changed), a lovely 80-year-old patient with a very large pelvic mass pushing on bowels, the bladder and both ureters, causing abdominal discomfort. The only possible treatment for this condition involves a laparotomy and removal of that mass. Mary can’t eat and her CT scan shows signs of severe bilateral hydronephrosis. Unfortunately, Mary also suffers from other medical conditions that will make major surgical intervention risky. It’s estimated Mary’s risk of death as a consequence of the required procedure is in the vicinity of 10% or higher. If Mary does not have the surgical intervention, she will die within a couple of weeks. Let’s assume you’re asked to provide an opinion on Mary. Will you say that without surgery Mary’s risk of death is almost certain. Or will you say, “First, do no harm” – the risk of a perioperative death in Mary’s case is too high. I made the observation that a colleague who advises not to engage in surgery because of a concern to do harm is perceived as senior and highly experienced. This colleague is conscious of overall outcomes and patient welfare is the primary concern. This surgeon’s primary concern is to avoid negative publicity. If the patient dies as a consequence of surgery it will be considered as harm and has to be reported as a medico-legal case to the authorities. If surgery is not conducted and the patient dies, it will not become a medico-legal case because it can be argued that the patient died from her illness. I am increasingly concerned with how hospitals and surgeons interpret risk and react to the pressures of Quality Assurance. I am simply concerned that public disclosure of clinical outcomes and the resulting pressure on clinicians will encourage the practice of defensive medicine in our health care facilities. I am concerned that in such times surgeons will aggregate towards the conservative spectrum of interventions and will put an emphasis on looking after their reputation in addition to looking after our patients. Finally, I am concerned that patients will be harmed as a result of non-intervention. In regards to Mary, she did die because an operation was withheld as it was deemed too risky. I realise she was elderly and her other medical conditions would have eventually taken her life. In our group we have a Morbidity & Mortality meeting and the case of Mary will be presented. Our Terms and Conditions include reviewing cases of patients who sustained harm from intervention and also patients who sustained harm resulting from non-intervention. Do we move towards a more conservative and risk-averse health care system? Do we discuss events resulting from withholding interventions as well as those resulting from interventions? Should it be changed to “First, do as good as humanly possible”?